all the land to the west of the Village was sold by the Trustees of the will of Robert Shafto to William Ord in 1781 and Ord land surrounded the Hall to the west, north & east. The Department of the Environment, in a 1978 report, considered the property "to be late eighteenth century with early and mid-nineteenth additions said to be by John Dobson". The DoE described the Hall as being of 'red brick, stone dressings, welsh slate roof & chimneys. Original symmetrical block of two storeys - five windows - has central door in classical surround. Projecting two bay right addition has long windows. Left addition has three bays and hip ended roof and subsidiary door and a later nineteenth century one storey end extension. Stone lintels and cills to sash windows with glazing bars. Moulded stone eaves cornice. Stone cill and floor bands. Small central gable dormer.'. The later nineteenth century one storey end extension was, in fact, a wind break wall to protect the south facing grounds from the prevailing winds. The name Hall is confusing as the Benwell Tower sale document of 1811 refers to the longstanding principal 'mansion house' of the estate as Benwell Hall. It is possible this was an Andrew Robinson Bowes affectation and that the name Benwell Tower reasserted itself with the construction of the new Tower in 1831. Alternatively it is possible that Benwell Hall had a different name until the 1830s when the title Hall became vacant, so to speak, and was adopted. Benwell Hall stood in heavily wooded grounds to the west of Benwell Village, and was approached by a long winding drive. In front of the Hall lay a large lawn with flower beds and a short flight of steps leading to a second, lower lawn. The grounds were split by the 'public road to Scotswood', which would later become Ferguson's lane. The Hall, plus five acres and three perches of land, lay to the north, while to the south lay the kitchen gardens in just over one acre of land. The Hall was on a north west - south east axis which would have provided extensive views over the Tyne and Derwent valleys. Behind the property stood its coach house and stables with the "west road" from Benwell Village to the Turnpike road running alongside and behind these buildings. The stone walls of these buildings still form part of the perimeter wall of the current housing development. The first occupant is thought to have been Auborne Surtees, who was born on 4 September 1711 and died on 20 September 1800. He was the father of Bessy Surtees who later became Lady Eldon. The next occupant was William Cuthbert. Eaneas Mackenzie in his History of Northumberland 1825, volume 2, p 405 states that 'on the west side of the village stands a handsome red brick house, surrounded by rich scenery, the residence of William Cuthbert.'. The Tithe Schedule of 1843 identifies William Isaac Cuthbertson, a business partner of William Cuthbert, as the owner. He was still the owner in 1850 as listed in Ward’s Directory of that year. Sometime during his occupation an adjustment was made to the land boundary at the south east corner, the site of the main entrance. Initially the public road made a short 'v' shaped detour here as can be seen on the 1780 map. This detour was straightened out enlarging and enhancing the area to the north, although the new alignment still left the Hall land divided in two sections. William Isaac Cuthbertson placed the Hall on the market for sale by auction on 24 March 1857. The purchaser was John Liddell, coal owner, who paid £3,600 on 13 May 1857. Mr Liddell lived in the Hall for 31 years, with the following notice appearing in the Monthly Chronicle of October 1888, p 477: 'On the 25 August 1888, at the age of 78, took place the death of John Liddell, J.P., a coal owner of Benwell Hall, Newcastle. The deceased was a partner in the Mickley, Cowpen and other coal companies.'. The Liddell family remained in residence until 1897, when they moved to Prudhoe Hall. The property was then leased to John Burdon for a period of 24 years, subsequently extended by a further two years. When the lease expired in 1924 John Liddell - son - sold Benwell Hall to William Bramble and the five acres of agricultural land to the north to Armstrong Whitworth Ltd (later Vickers Armstrong Ltd) for use as a sports field. Armstrong Whitworth also bought some adjoining land from the Ord estate. 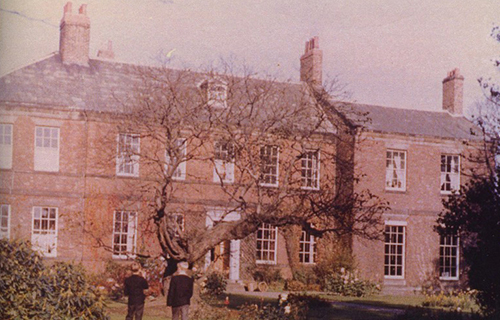 The Bramble family lived at Benwell Hall until the late 1970s. In 1930s Mr Bramble sold the kitchen garden land south of Fergusons Lane. The larger (eastern) area, including the greenhouse and vinery, was sold to Mr J Dixon, a retired café proprietor, who built a bungalow for his own use. The land to the west was sold to Smelts Theatres Ltd, who built the Rex cinema in 1937, and to James McEwen, who built the residential houses of Bramble Dykes. The Dixon land later became the site of a Masonic Lodge and later Ferguson's Lodge, a care home and the current occupant. The Rex cinema was demolished in 1969 and replaced by the 'Fairholm' club. Bramble Dykes remain. William Bramble died in 1948 but his six daughters continued to live there. The last daughter, Catherine, died on 14 April 1980. The previous year the now almost derelict Hall had been purchased by Northern Housing Association who demolished the building and built the current sheltered housing development in 1982.